I don’t wear much makeup during the summer, usually just if I am going somewhere special or for a dinner. 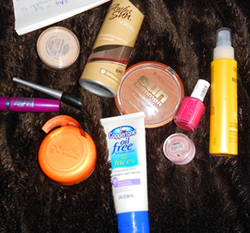 Below is a list of my top 10 go to products for the summer. 1) John Frieda Sheer Blonde Go Blonder Controlled Lightening Spray – I love this spray to help give my hair bright blonde highlights. 2) BareMinerals Matte SPF 15 Foundation in Medium Beige – I find that this is a very light foundation for summer and it doesn’t melt away in all the heat. 3) Wet ‘n’ Wild H2O Proof Liquid Eyeliner in Ultra Black – This eyeliner stays put all day and it is super cheap. 4) Maybelline Volum’ Express The Falsies Waterproof Mascara in Black – This mascara stays in place and is really waterproof. 5) e.l.f. mineral eyeshadow in Sweet #6503 – I wear this the most in the summer when I do wear an eye shadow. It is a beautiful light pink shimmer colour that really helps light up my eyes. 6) got2b Defiant Define & Shine Pomade – I use this to tame all my flyaways. It smells really nice too, like oranges. 8) Amber Sun by Norvell Self Tanning Aerosol – I use this to get my tan started in the summer or to even out my tan. Or if I have a rainy period where I can’t catch any rays. 9) Essie Peach Daiquiri Nail Polish – This is my go to nail polish colour for the summer! 10) Coppertone Oil free Faces SPF 30 Sunscreen – I apply this to my face whenever I am out in the sun. I also love the Wet N Wild Eyeliner. It is very cheap and works great!